Facts about the most ridiculous pitcher of our lifetimes. It’s been months. I wanna bring this back because Jason Neighborgall’s baseball-reference page remains one of the hidden gems of the entire internet. In 42.1 career innings, Jason Beckley Neighborgall hit 13 batters. In 952.1 career innings (and counting), Milwaukee right-hander Yovani Gallardo has hit 12 batters. Miraculously, at some point in 2007 Jason Neighborgall reached Low-A South Bend. He pitched one inning…spread over 5 appearances. In his first appearance, he got current Indians catcher Carlos Santana (then with the Low-A affiliate of the Dodgers, the Great Lakes Loons) to ground out. In that one “inning” Neighborgall faced 22 total batters. He walked 12, hit 3, and gave up 12 runs. Two of his three outs were K’s, but of course one of those K’s was a wild pitch on which the runner reached so actually only one of his THREE outs made were strikeouts. I’m starting this. I feel kinda bad because the whole Jason Neighborgall story is a bit sad but oh my god his B-R page is unbelievably awesome. Long story short, Jason Neighborgall was a pitcher in the Diamondbacks system with legendary stuff with possibly the worst command of all time. The numbers are staggering. Here’s today’s stat. 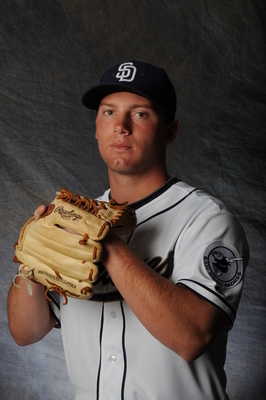 Padres pitching prospect Robbie Erlin is known for his elite pitchability and command. Over 326.2 minor league innings, Erlin has unintentionally walked a total of 50 batters. In Neighborgall’s brief 42.1 inning career, he unintentionally walked ONE HUNDRED AND TWENTY EIGHT BATTERS. Yes, 128.